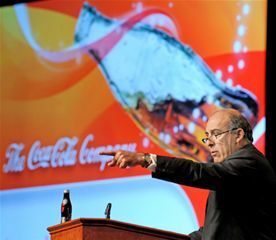 That’s according to Robin Gee, Head of Employee Engagement for Coca-Cola Refreshments (CCR). Gee will be a speaker at the marcus evans 5th Annual Internal Branding & Employee Engagement Conference from February 24-25 at the Doral Golf Resort & Spa in Miami, FL. “We engage our employees in aggressive efforts to eliminate waste and reinvest those savings in ways that are visible and meaningful to our employees. Our employees embraced this effort and have found creative ways to eliminate waste, which, in turn, resulted in multi-million dollar investments in our total rewards package and talent management practices as well as investments in technology and customer-focused initiatives. “Our experience supports that strong leadership visibility coupled with consistent communication and employee involvement has been well received by our employees. In times of change we communicate transparently and share what is not changing along with what is changing. We act deliberately but swiftly while always communicating the strategic goals to be achieved.